Get a glimpse of what Adam Jensen was up to between Deus Ex: Human Revolution and Deus Ex: Mankind Divided in a new story DLC. Square Enix has announced that a second story DLC for Deus Ex: Mankind Divided will be released in February. The game's first story DLC, System Rift, was released back in September. The new DLC is titled A Criminal Past, and it is set in the time between Human Revolution and Mankind Divided. 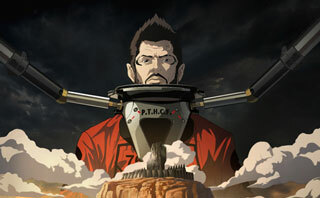 The new DLC takes players back to Adam Jensen's first mission as part of TF29. He's sent into a high security prison for augmented people, where he'll have to pose as an inmate to "track down and retrieve sensitive information from a fellow undercover agent who has gone dark." The A Criminal Past DLC will release on February 23. There's no official word on how much the DLC will cost, but the previous DLC was $11.99, so that's probably a good guidepost. If you own the Mankind Divided Season Pass, the new DLC is included. Well that's certainly news. I kinda figured the game was "done" and we'd be waiting for the next game to actually have more Deus Ex to play, but this is ok too. Now to just download it all over again...yaaaay. Not really much of a surprise - the season pass did announce two story DLCs. So after this, they should be done and finished in terms of story. I am not sure what to make of these DLCs that don't fit into the game. On the one hand, more of a good thing is appreciated and there's nothing wrong with side-stories, extra world-building and of course, more gameplay. But on the other hand, when the main game is a large experience, I kinda like the idea of expanding *that* and making it an even larger and richer experience. It keeps it cohesive, streamlined, progress/gear/stats/etc remain the same and so on. I liken this stuff to what happend with Borderlands Pre-sequel vs BL2. BL2 has so much content and stuff to do, whereas the Pre-Sequel is comparatively barren. I would rather PS have been added to BL2, making one even larger game with more classes, more content and so on. There goes my hope that the DLCs will be bundled into a single, linear experience like the Missing Link in the Director's Cut, which improved the DLC side mission a lot instead of being a standalone dungeon. Skill points and equipment still matter for your playstyle, disjointed side stories each coming with a different/blank Jensen are boring. Don't really care for this stand alone stuff.. I want to see more of the main story as we know it. Why not spend the time to enhance the main experience?